The AMZ had one sequential distribution cut, while the AMZI had zero cuts for the fourth quarter. The majority of constituents in both the AMZ and AMZI grew their distribution sequentially and year-over-year. Distribution growth has downshifted to a lower rate as MLPs pursue self-funding equity, and today’s high growers will likely see moderation over time as MLPs move to eliminate incentive distribution rights. One AMZ distribution cut the only blemish in an otherwise clean quarter for distributions. 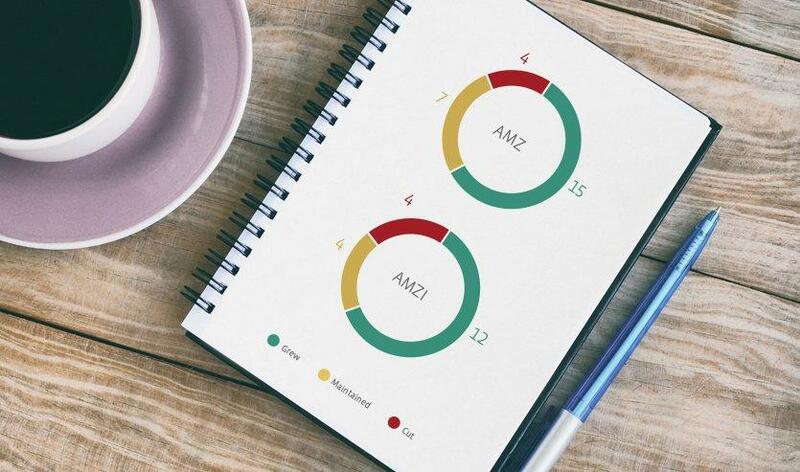 The pie charts below reflect the quarter-over-quarter (Q/Q) changes to distributions for the Alerian MLP Index (AMZ) and Alerian MLP Infrastructure Index (AMZI), comparing 4Q18 with 3Q18. For clarity, 4Q18 distributions refer to the distributions that will be paid in 1Q19 as a result of operational performance in 4Q18. EQGP Holdings (former ticker EQGP) and Valero Energy Partners (former ticker VLP) were not included in our analysis as they were removed from the Alerian Index Series in early January and did not declare distributions for the fourth quarter. EnLink Midstream Partners (formerly ENLK) declared a 4Q18 distribution with a record date of January 24 before subsequently being removed from the Alerian indices and was therefore included in our analysis. Similarly, Dominion Energy Midstream Partners (formerly DM) announced a distribution with a record date of January 14, which was prior to its removal from the Alerian Index Series, and is thus included in our data. 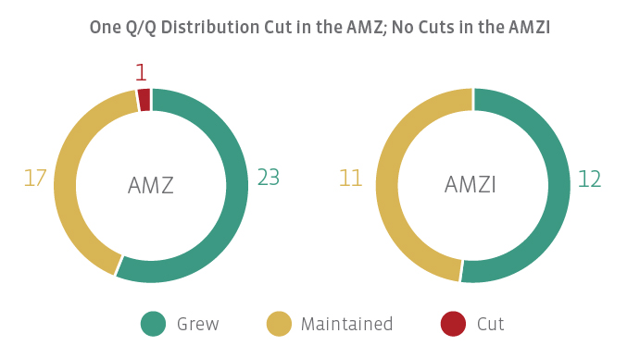 Notably, there were no cuts for constituents in the AMZI and only one cut among AMZ constituents for the fourth quarter. AMZ constituent American Midstream Partners (NYSE:AMID) disclosed it would stop paying a distribution as a result of entrance into an amended credit agreement. AMID cannot pay a distribution until its leverage ratio falls below the 5.0x threshold as specified in its credit agreement. Notable Q/Q data points for the AMZ and AMZI. The majority of constituents in both the AMZ and AMZI grew their distributions quarter-over-quarter. General partner Antero Midstream GP (AMGP) led the AMZ with the highest sequential increase by raising its distribution 13.0% sequentially to $0.29 per unit. For the sixth straight quarter, Antero Midstream Partners (NYSE:AM) was the leader in the AMZI, increasing its distribution by 6.8% to $0.47 per unit. Other constituents with notable sequential growth were Phillips 66 Partners (NYSE:PSXP) with a 5.4% increase and Shell Midstream Partners (NYSE:SHLX) with a 4.7% increase. 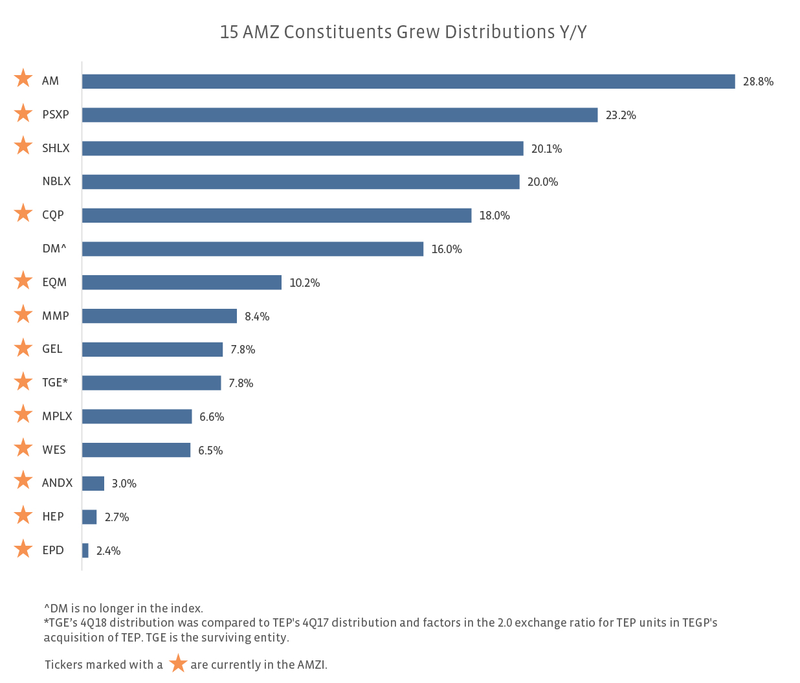 Most AMZ constituents grew their distributions year over year. The charts below compare the 4Q18 distribution with the 4Q17 distribution for those names that were in the index in both periods. Please note that this method introduces survivorship bias. As a result of the recent methodology change in the AMZ, sixteen tickers are not reflected in the year-over-year analysis since they were not in the index in 4Q17. EQGP Holdings and Valero Energy Partners were not included due to the corporate actions mentioned previously. Four constituents in both the AMZ and AMZI had a year-over-year decrease in their distributions, including NuStar Energy (NYSE:NS), TC PipeLines (NYSE:TCP), Buckeye Partners (NYSE:BPL), and Energy Transfer (NYSE:ET). ET's 4Q18 distribution was compared to Energy Transfer Partners' (former ticker ETP) 4Q17 distribution, as ETP was the predecessor in both indices. There were no distribution cuts in 4Q17, so we did not see any distribution cuts roll off this quarter on a year-over-year basis. Distribution growth continues to trend toward moderation. The fastest-growing distributions continue to come from companies with incentive distribution rights (IDRs). AM, PSXP, SHLX, and Noble Midstream Partners (NYSE:NBLX) saw 20.0%+ distribution growth on a year-over-year basis, and all have IDRs. As we mentioned last quarter, MLP management teams are continuing to consider and pursue IDR eliminations. As part of its merger, EnLink Midstream (NYSE:ENLC) agreed to eliminate EnLink Midstream Partners' IDRs. In February, Equitrans Midstream (NYSE:ETRN) announced it will exchange and eliminate EQM Midstream's (NYSE:EQM) IDRs, and refining general partner PBF Energy (NYSE:PBF) will eliminate the IDRs of AMZ constituent PBF Logistics (NYSE:PBFX). The reasons cited for these transactions include lowering the company's cost of capital, increasing financial flexibility, and simplifying and aligning corporate structure. Additionally, the investment community has expressed frustration with IDRs. This is an area to watch as more IDR elimination announcements are possible this year. 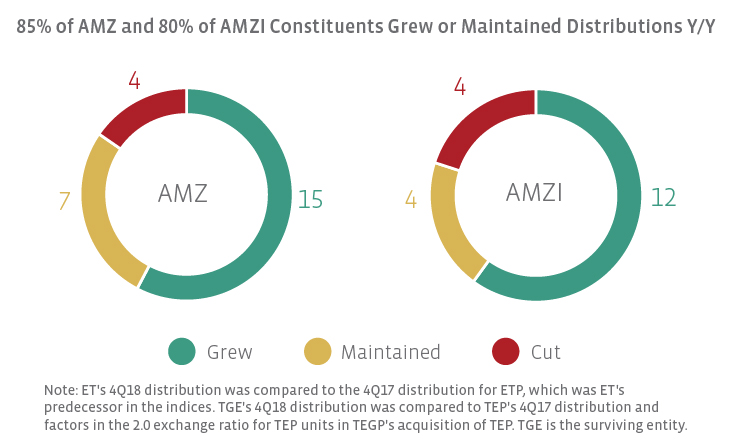 As of the January 25 special rebalancing, 73% of the AMZI and 68% of the AMZ1 had eliminated IDRs, with two IDR elimination transactions still pending in 1Q19. While MLPs with IDRs tend to have higher distribution growth than their peers, it's important to note that distribution growth in general continues to moderate across the MLP space. In the AMZI, only two constituents had sequential quarterly distribution increases greater than 5%, and the median percentage growth was 1.8% among constituents that increased distributions Q/Q. In a similar vein, only four AMZI constituents and seven AMZ constituents grew in the double-digits from 4Q17 to 4Q18. While distribution growth is moderating, it accommodates other positive developments among MLPs, including far fewer equity issuances as companies move toward self-funding, better leverage metrics, improved distribution coverage (a topic we'll discuss next week), and unit buybacks in some cases. For instance, Enterprise Products Partners' (NYSE:EPD) management recently commented that their investors expressed a clear preference for buybacks over distribution growth. Distributions and buybacks are both means of returning capital to unitholders, but as we've discussed, buybacks may not make sense for everyone. 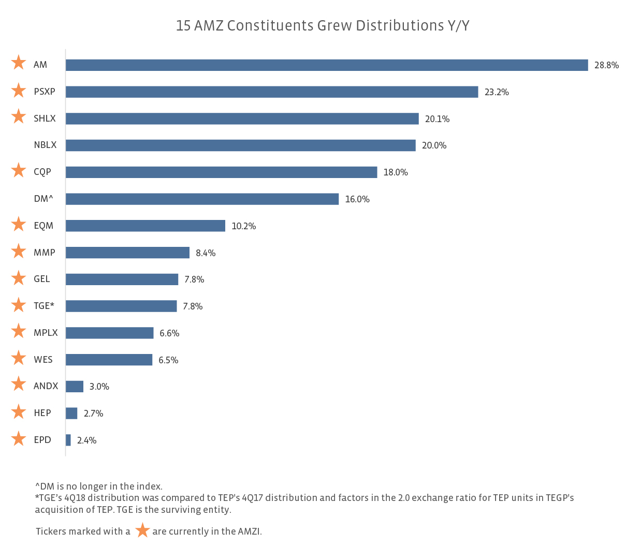 The fourth quarter was a nearly spotless quarter for MLP distributions, and most constituents in both the AMZ and AMZI grew their distributions quarter over quarter and year over year. Distribution growth has downshifted to a lower rate as MLPs pursue self-funding equity, better leverage metrics, and improved distribution coverage. Today's high growers will likely see moderation over time as MLPs move to eliminate incentive distribution rights. 1 These numbers do not include EQM, which announced the closing of its IDR elimination transaction on 2/22.